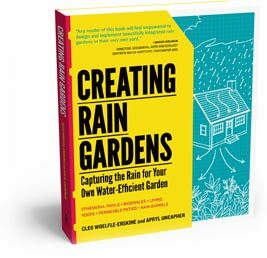 This Friday, September 14, 2012 at 7:30 pm author/activist Cleo Woelfle-Erskine gives a public talk on his new book Creating Rain Gardens. 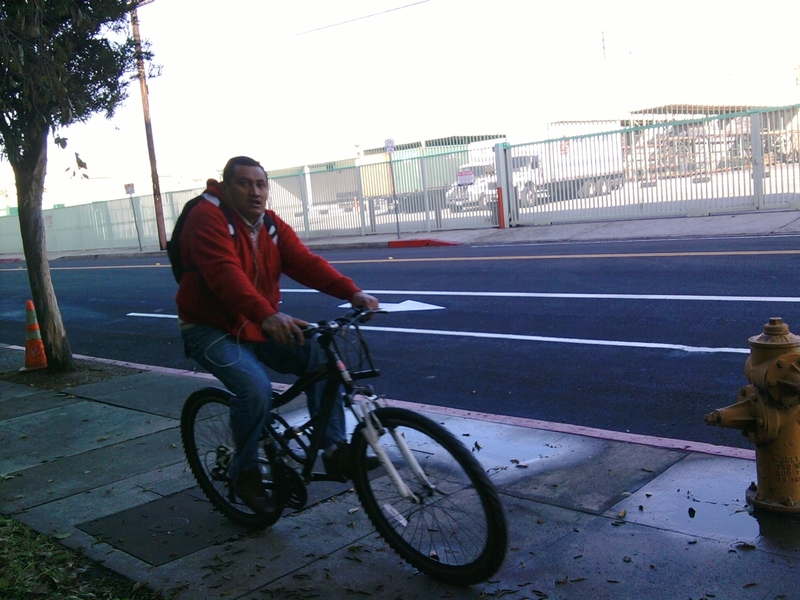 The talk takes place at L.A. Eco-Village, 117 Bimini Place, LA 90004. There’s a requested admission of $5 to $10, but no one turned away for lack of funds. Reservations recommended, contact eco-village: crsp [at] igc.org or 213/738-1254. Rain always means going out to watch the water rise, and this morning a friend and I hustled out to Ballona Creek to the check out the recently completed rain gardens in action. I posted about them here and here. When I got home a few hours later, the County’s rain gage indicated that Ballona Creek near there had received 0.8″ – so this was a healthy first test for the rain gardens. Santa Monica Bay Restoration Commission staff were out taking samples and observing its performance as well – and now doubt we will all be eagerly watching how the gardens adjust and adapt to the season’s flows. A flash from the past! I created this 8-page Landscape Rainwater Harvesting booklet for a workshop I taught the summer of 2008. The class was held June 14th 2008 at Los Angeles Eco-Village. The main activity was building las trincheras – an urbanite-terraced rainwater harvesting garden that I wrote about here a while back – and in this vid. It’s funny, the workshop was pre-creekfreak – the month before Jessica and I got started with L.A. Creek Freak in July 2008. From mid-January through last week, I’ve been working to construct a rain garden in a friend of mine’s mother’s backyard. This is my first real paid landscape job, and the first time I’ve been in charge of something in someone else’s yard… so there are plenty of lessons learned. I’ve gardened for a long time, and, for the past couple years, I’ve been experimenting with creating passive rainwater harvesting earthworks. 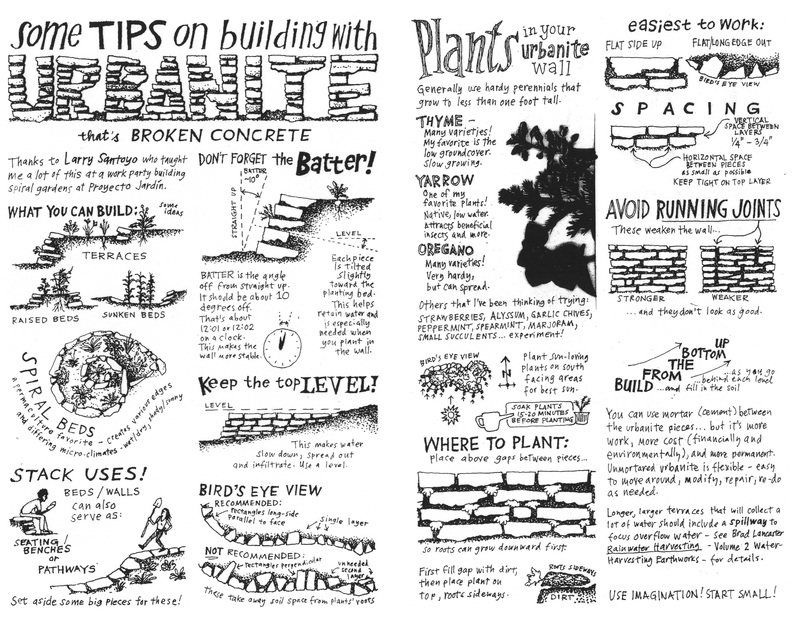 I mostly make these with retaining walls made out of stacked un-mortared broken concrete – called “urbanite.” Urbanite is an excellent material that’s locally free and abundant. Re-using it diverts it from landfills. The water harvesting earthworks are very much inspired by the work of Brad Lancaster, whose books I highly recommend for anyone looking to do this sort of stuff at home. Side yard - before project construction. Downspout visible in top middle of picture. Tree trunk visible on the left. Stepping stone path in mid-picture. Site slopes downward toward the bottom of the photo. Note also the two small temporary dams made out of stacked bricks - in lower left and near center of photo. I was invited to try to solve a drainage problem at the site. The roof downspout empties onto a sloped side yard. The surface of the sloped yard looked like dirt, but it’s actually decomposed granite (or something similar.) The water from the downspout was creating a little stream that ran downhill into the backyard, where the sediment and water build up on a paving-stone patio. The owner had set a large metal basin below the spout during rains, and had set up small temporary stacked brick check-dams in the path of the water flows. The area I had to work in is somewhat narrow, as there’s a gate right near the downspout, and a stepping stone path about 4 feet from the house, paralleling the wall of the house. Another complication is that the site is on the north side of the house – which is shady. Additional shade was provided by a deciduous tree growing at the base of the slope of the side yard. My friend’s mom had asked a landscaping contractor to solve the problem. His proposal was to dig a big pit and attach a pump which would push the water uphill into the street in front of the house. I suggested to the her that rainwater was indeed a resource and that we should try a solution that would detain and infiltrate that resource on site. Pumps require energy input, and occasionally break down. I wrote up an estimate, got my advance, and started assembling materials. There wasn’t really any soil to work with at the site, so I ended up buying bags of soil at a local garden store. I purchased shade-tolerant, drought-tolerant natives at the Theodore Payne Foundation nursery (plants listed below.) And I started to scavenge up broken concrete wherever I found it. I hired my friends to help me. Thanks very much to Bobby, Erik (half of the Homegrown Evolution blog team,) and Hunter, for working hard and not minding me bossing them around (or at least not complaining too much.) A big rainstorm was due at week’s end, so I was motivated to get the project completed. Not only did I want to test the rain garden’s functionality, but I was planting native perennials, so I wanted to plant early enough for the rains to help them get established. In three and a half full days of work, we got the rain garden installed. We started at the lower end and worked upwards level layer by level layer. We built up level beds out of broken concrete and brick. These were un-mortared, thought we did use mud between them. The finished planter had three stepped terraces. Areas along the top were designed to serve as seating. Though it’s a rain garden, designed to infiltrate water, there’s really no surface flows expected. The level terraces encourage the water to spread out and to soak in. The overall bed acts like a sponge, absorbing the flows from the downspout, causing the rainwater to soak the plants roots and to seep into the ground. Water mysteriously pooling at the upstream end of the project! Two days later, I made my way over to the client’s house during a large rainstorm, smug in my overconfidence that I was going to see the bed functioning beautifully… and that I would soon become the local water harvesting guru, besieged with requests to build all sorts of beautiful garden beds all over the southland. When I got there, during a lull in the storm, I discovered that rain had collected at the upper end of the raised bed. The rain pooled there, then, to my dismay, overflowed along the perimeter of the bed… more-or-less completely avoiding the beautiful bed I’d laid out for it. The flow of the water was digging a little gully around the project… and, of course, depositing plenty of sediment in the lower patio area. Gully running alongside such a good looking raised bed! When I initially noticed this failure, my first thought was that my rain bed hadn’t failed, but that I just hadn’t read the site well enough. Brad Lancaster calls for long and thoughtful observation before undertaking this work. I figured that my work was perfectly fine, and that the nearby sloped driveway (and probably even the neighbor’s yard) was probably contributing too much runoff into this area. That’s when the rain starting coming down again… and I noticed that the downspout’s water was entering the bed, then immediately exiting through the upstream bed wall. And I was observing this at this point the rain was flowing very little. The rain, much smarter than we humans, had found a short-cut, and staying at the very edge of the bed, then exiting it, pretty much entirely bypassing the bed. So much for my reputation as a water harvesting expert! One mistake I’d made was that I’d tried to hold the rainwater fairly high off the ground, in a pretty leaky vessel… so when the water found a small opening, it quickly flowed through that leak, clearing some soil in its way, reinforcing its path, creating a full-fledged bypass. I hastily convened Erik and Bobby out on site again, and we took apart the entire upper end of the project and removed a layer, so as to hold the rain closer to the ground. (One nice feature of working with unmortared urbanite is that it’s easily taken apart and reconfigured.) We reconfigured the new upper end to usher downspout water into the center of the bed. The gutter basically empties onto a ramp, and at the base of the ramp is a flat piece of permeable concrete surrounded by small rocks. This set-up serves to deliver the rainwater into the middle of the upper bed, and to spread it out a bit. In addition, we reworked the walls of the upper bed. 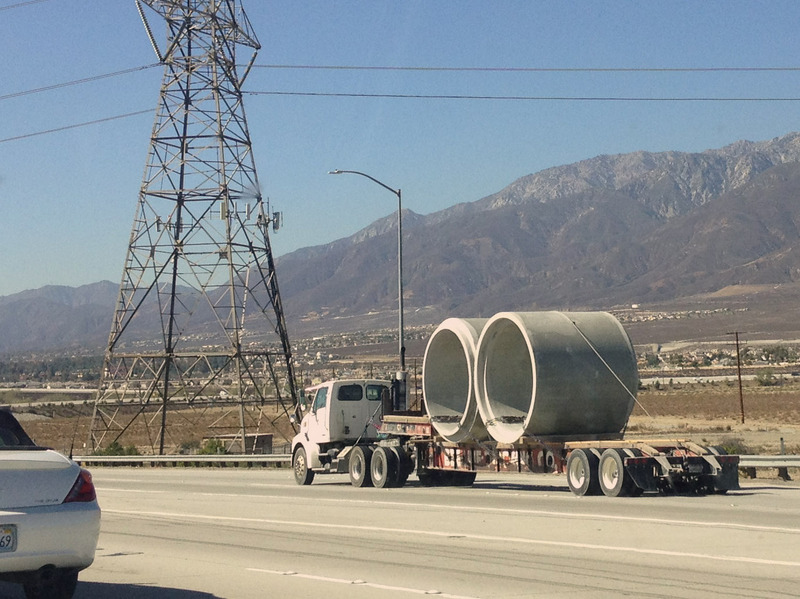 We used larger concrete pieces, and put them together as tightly as we could – with fewer and smaller gaps between. We also brought some clay soil from my home and we used the clay to plug the gaps between chunks of concrete. There was practically no clay in the topsoil I’d purchased, nor in the decomposed granite at the site, so the mud we had used as mortar was more permeable than a healthier soil mix that does contain some clay. As the clay gets wet, it becomes less permeable, so it keeps the gaps filled, preventing leaks. 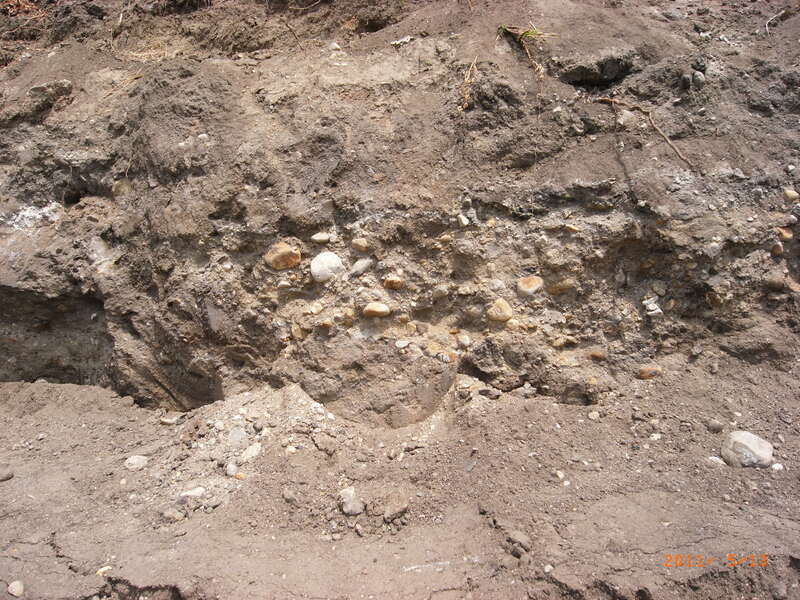 In the area where the water first spreads, we used a lot of clay, both between layers, and between pieces of concrete within each layer. For the rest of the bed, we inserted clay to patch up obvious gaps we could see. These fixes more-or-less worked. The lowered bed, the clay and the ramp-spreader have survived a couple of good-sized storms without any major failures. I had been thinking that, had it blown out again, I might need to do some sort of “level spreader” – perhaps a rock-filled gutter 3-4 feet long, with holes in the bottom. This would serve to spread out the flow more evenly. Unfortunately I don’t think it would look that good, though eventually the plants could camouflage it. So far, it doesn’t appear that it’s needed. In a good sized storm, the whole bed does leak… slowly. And is is meant to… but it hasn’t had a big blow-out yet. Unfortunately, though the client likes the look of the project, it hadn’t entirely solved the problem it was supposed to. There was still some water and sediment getting down to the patio below, but much less than before. In working on this, I’ve come to the conclusion that it’s actually a somewhat difficult task to re-spread out water after we’ve concentrated it. The roof and gutters concentrate water into the downspout, so the biggest task in detaining and infiltrating that water is to undo that concentration. This is analogous to watershed management and river restoration. It’s much easier and less failure prone to disperse interventions throughout the watershed, as opposed to intervening in the river corridor. 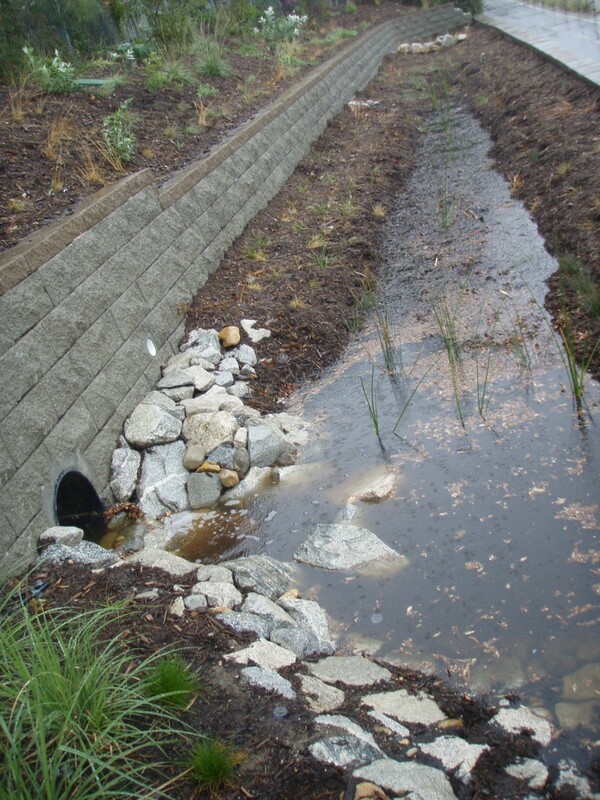 It’s worthwhile to work on smaller interventions in the upper watershed, which would be less prone to catastrophic failure when compared with projects that deal with huge volumes already concentrated in the lower portions of our rivers and creeks. When the project was leaking a lot, I had re-built the temporary stacked brick dams at the downstream end, below the bed. Not feeling quite as confident in my prowess, I left these temporary dams in place for nearly a month, while I kept an eye on my new iteration to see how it was working. When I examined them, there was still some sediment gathering behind them, though not a lot, and no serious gullying like there had been when the first real blowout occurred. I decided that it would be worthwhile to make those small temporary dams into small permanent stepped terraces. Using more urbanite and bricks, I created a couple of level “smile berms” (also called “boomerang berms.”) These parenthesis-shaped terrace walls detain and slow down the water still leaking and let it overflow into a lower garden area, instead of going into the patio. I just built these last week and I am looking forward to seeing them tested in the rains predicted this week. We’ll see. – Though I like decomposed granite as a natural-looking permeable material for use in building public parks (as North East Trees and others have done along the Los Angeles River,) I hadn’t really worked with it before. I was a little surprised at the way it behaved. It’s basically little rocks, so the water doesn’t really stick to it at all. It’s permeable, but its infiltration seems to be more like gravel than soil. – There’s no substitute for long and thoughtful observation. To do rainwater harvesting earthworks like this, I need to go and see what is really happening while it’s actually raining. Even my observations immediately after a rains were colored by my own hubris. Rainwater won’t necessarily go where I expect, but will find the path of least resistance. – Enjoy failures… that’s where we learn and adjust. – Add some extra time onto your estimates whenever you do paid landscaping! Do you want to celebrate the water? A strong degree of brute efficiency will clearly be necessary, but as the first rains wash into L.A. County, the answer to Hall’s question is an unequivocal yes. Yes! Read the full article here. Thanks Emily Green and Jessica Hall! You are currently viewing the search results for "rain garden".